In 2015, Nepal was hit by a devastating earthquake. An estimated 8,000 lost their lives and hundreds of thousands of people were made homeless as entire villages were flattened. Many lost everything. The international response was swift; relief and aid work began within days, but since then recovery has been slow. Already one of the least developed countries in the world, the earthquake compounded many of Nepals socio-economic problems. 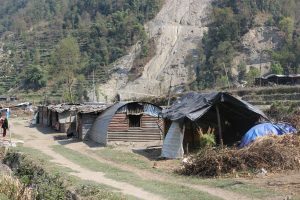 25% of Nepal’s population are classified as living in extreme poverty (Living on less than $1.25 per day) and the earthquake caused an estimated $10 billion dollars of damage. There has been a massive impact on employment and income; 68% of Nepal’s population work in the agricultural sector but when the earthquake caused extensive livestock and crop loss, thousands lost their only sources of food and income. Without opportunities to create income, families continue struggle to recover. As of 2017, over 70% of those made homeless by the earthquake are still living in temporary shelter. The scars from landslides are still visible in the landscape. Due to the loss of job opportunities, migration has also risen. Many do not have the opportunities or resources to generate income which has driven people to look for employment abroad. The Nepali government estimate that 1,500 Nepalese people leave the country every day to find work. This is leaving rural communities increasingly destabilised as more adults of working age are leaving their families- leaving children and older parents to care for them. International Needs launched the Livelihoods Programme in Sindhupalchowk district as a response to the 2015 earthquake. Sindhupalchowk was among one of the most badly impacted areas, with many families loosing everything. The aim of the programme is to support families affected by the earthquake to rebuild their livelihoods and create new sources of income. Through the programme, families receive support through resource provision such as tools and livestock. They are also supported with vocational skills training and finances to build their own small businesses. Individuals and households are given the choice of how their families are supported. Many elect for livestock support to start their own farming businesses, others opt for skills training and resources to make their own furniture making businesses and other trades. We are also working to develop community support groups to provide more skills training, and producers’ groups to build the capacity of farmers to sell their produce. We are currently working with three hillside villages in Sindhupalchowk supporting families. Our goal is to extend this programme in 2019 to reach more individuals with resources and training which is changing lives. Livestock is a major aspect of this programme. For example, a goat can produce income both through its provision of milk and meat, but offspring can be sold or used as currency to purchase other resources. Through the livestock programme we have so far supported families with goats, cows, buffalo, pigs and chickens. Ratna lives with his wife and four children in a rural village in Nepal. After the 2015 earthquake, Ratna and his family were living in a shed of corrugated metal; his home collapsed in the earthquake along with the houses of most of his neighbours. He works as a farmer to provide food for his family but the small piece of land he owns was not productive and could not provide for them no matter how hard he worked. Instead, Ratna and his wife were working as construction laborers to get by. 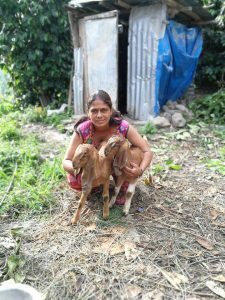 Through our Livelihood programme with International Needs Nepal, Ratna asked for support to build a poultry farming business. 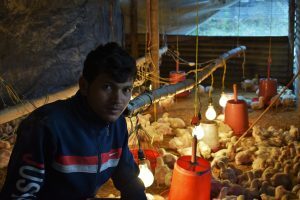 Ratna had already built a chicken shed with the support of his neighbours. Ratna with his baby chicks. Ratna was supported to purchase 200 chicks to rear and sell. His business is now growing and creating a stable income. With IN’s help Ratna purchased 200 chickens and materials and food to properly care for them. Within a month Ratna was already making profits and purchased more chickens. From his business, Ratna has been able to continue to expand his business and has been able to take out a loan to build a new house for his family. With his growing business, Ratna is happy that he can make a good income and support his family as well as repay his loan. 25% of Nepal’s population live in extreme poverty (live on less than $1.25 per day). 80% of the homes in the areas where we are working were severely damaged or destroyed as a result of the earthquake. An estimated 1,500 people leave Nepal everyday as they are driven to search for work abroad. The 2015 earthquake caused an estimated $10 billion dollars in damage (almost half the GDP of Nepal). On September 9th to the 18th, we are hosting Esther Thapa. Esther is the executive director of IN Nepal. She and her team work to support families through community workers across the districts of Nepal and empower women by offering vocational training at the Lydia centre Kathmandu. The Lydia centre is an amazing place that offers women already so disadvantaged from their gender and their caste, an opportunity for life. By learning specific tailoring skills and gaining vital life skills, Lydia women can face the future with confidence. Please do take a look at this video we posted to demonstrate the incredible outcomes of the work of Esther and her team. If you would like to come and hear Esther speak or would like to invite her to an event in your community or church, please call the IN office on 01883 331332. Since the April 25th earthquake last year, IN supporters demonstrated such generosity and care for the people of Nepal by raising over £44,000. This enabled us to mobilise quickly and distribute relief in the form of food and rigid shelter materials to hundreds of families and households in the remote and mountainous areas.